Chelsea is currently the Regional (OR/WA) Sensitive Species Data Coordinator at BLM and serves as an associate editor for Northwestern Naturalist. Recently she received her Master’s in Environmental Studies from The Evergreen State College with an emphasis on Wildlife Biology and Management. She earned her Bachelors of Science from Shepherd University where she majored in Biology and minored in Environmental Science. Her master’s research was on the habitat utilization, spatial distribution, and genetics of the Oregon spotted frog in western Washington. She enjoys developing and implementing interdisciplinary wildlife conservation projects, and has helped colleague’s craft, edit, and analyze their own projects. 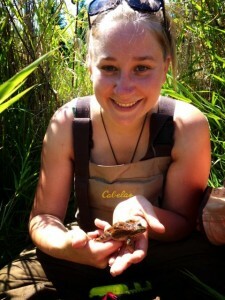 Chelsea loves romping around in wetlands, teaching, catching frogs and salamanders, fishing, and birding. During graduate school, she was the Writing Assistant for two graduate programs, helped graduate students with statistics and research design, and helped students use natural history collections and field observation to learn bird ID and ecology. Between her undergraduate and graduate work, Chelsea worked in the fields of Microbiology and Immunology where she helped design vaccine candidates for HIV, and did research on Tuberculosis and Shigella. In her spare time, Chelsea enjoys her life in Portland, Oregon by kayaking, hiking, and birding with her husband.